I came to my computer this morning with every intention of writing you a fantastic post on pesto. Fast forward thirty minutes… I am staring semi-blankly at my computer screen a step away from drooling. I look down and a big-ugly-flying bug has committed suicide in my smoothie. Is this an omen? Yikes. At least my Monday is going slightly better than Mr. Ugly Bug’s. I could be face down somewhere in a liquid vat of coconut milk and greens. Rough. I message my husband on G-chat. I complain that the hamster in my brain refuses to jog. The wheel is not turning. I need some pesto inspiration. I ask him for some thoughtful words on pesto. He responds with a factual “It’s green”. This is going well. I ask him if he has anymore slightly less literal thoughts on the subject, to which he confesses “No idea. I barely understand it.” His hamster is tired too. I get it. Pesto can be kind of mysterious. I’m gonna help you all demystify it. 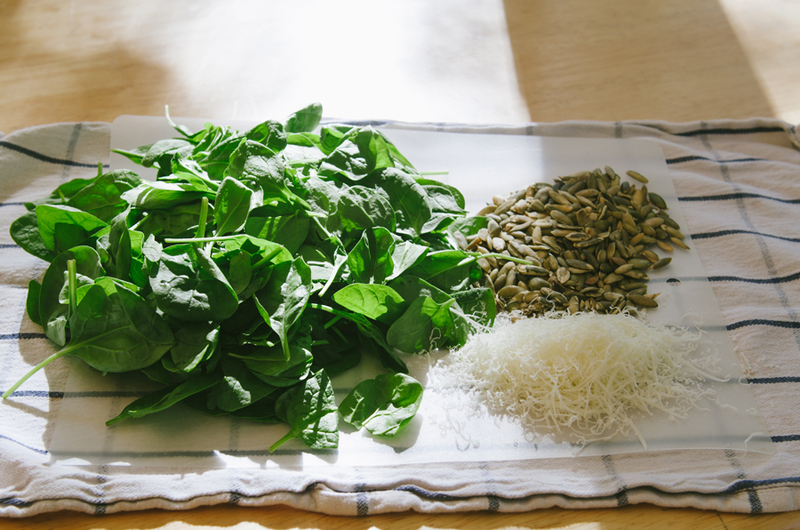 Greens + Cheese + Oil + Nuts/Seeds + Garlic = PESTO! A totally simple equation. Finally a word problem I understand. If you are vegan or paleo, simply sub out the cheese for nutritional yeast! Your pesto will still taste amazing. In this recipe I used vitamin-packed spinach mixed with pepitas! We’re getting seasonal. Pumpkin craziness all up in here. In short, if you can make a smoothie, you can totally whip up pesto. Put all of your ingredients into a food processor and run that baby until they all come together. 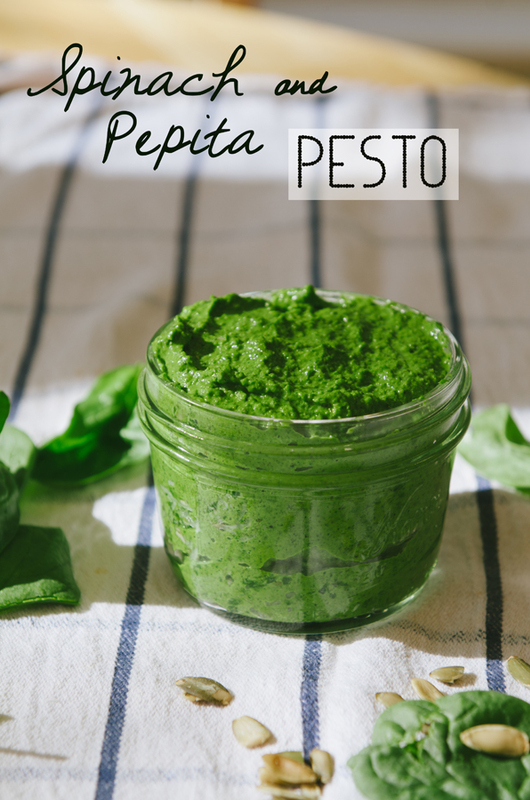 Presto… you’ve got PESTO! Oh, wow. That happened. But really, it’s super easy. Commence slathering it on everything. I did it up right, and made an awesome spaghetti squash pasta! Recipe coming at-cha later this week. Get excited. It’s a good one. Pretty, right? 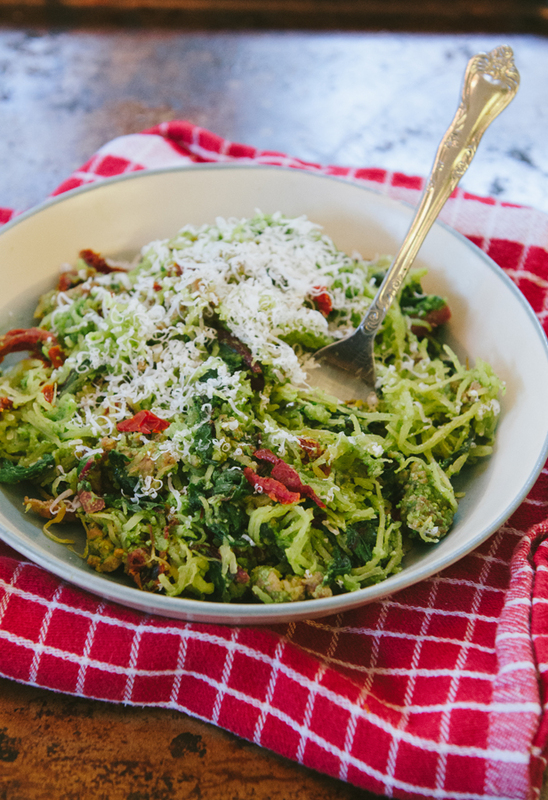 Combine all of your ingredients into a food processor. Process on high until all of your ingredients come together in a smooth paste. Use right away, or save in an airtight container such as a mason jar for later use. This should last for about a week in the refrigerator.Enjoy! Omg Gina love it! Thanks for the vegan option. Another way to save it is to put it into ice trays, freeze into cubes, and then once the cubes are frozen put them in a plastic bag. This way you can have them all winter and can make a big huge batch all at once. Songs to play at a bug’s funeral: It’s a hard knock life. Thank you for the vegan options! You always have such simple, tasty, and beautifully photographed recipes. Many thanks!